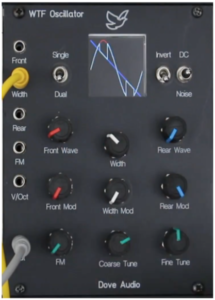 Dove audio is proud to announce a completely new concept in waveform morphing for it’s new oscillator module for both Euro and MU(MOTM and dotcom) modular systems. The Window Transform Function (WTF) is a radically different way to morph between two waveforms, create a hybrid mix of two waveforms previously unheard of. Pre-production prototype module in euro-rack format. The concept is a relatively simple one, two waveforms are used (front and rear) and are synchronous. A ‘window’ can be opened in the front waveform allowing a portion of the rear waveform to be ‘inserted’ into the front waveform. It is also possible to have dual windowed waveforms (as shown in the picture above). 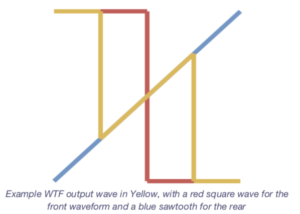 Below is a drawing showing the resultant output when windowing a sawtooth with a square wave. Front wave, Rear wave and Window width have full independent control via CV. After a 12+ month break the world of synthesizer design Paula Maddox is back with a new company and fresh new ideas in the form of Dove Audio. She has a proven track record spanning nearly 20 years for delivering high quality and unique designs to the industry. Dove Audio aims to produce unique and innovative audio products for the electronic music enthusiast and professional alike. I plan on having Paula on a show in the Near future to discuss Dove audio and the WTF oscillator. This entry was posted in Eurorack. Bookmark the permalink.